Daniel 7:13 - I was watching in the night visions, and behold, One like the Son of Man, coming with the clouds of heaven! He came to the Ancient of Days, and they brought Him near before Him. Hebrews 12:1 - Therefore we also, since we are surrounded by so great a cloud of witnesses, let us lay aside every weight, and the sin which so easily ensnares us, and let us run with endurance the race that is set before us. Jude 1:14-15 - Now Enoch, the seventh from Adam, prophesied about these men also, saying, "Behold, the Lord comes with ten thousands of His saints, to execute judgment on all, to convict all who are ungodly among them of all their ungodly deeds which they have committed in an ungodly way, and of all the harsh things which ungodly sinners have spoken against Him." Zechariah 14:4-5 - And in that day His feet will stand on the Mount of Olives, which faces Jerusalem on the east. And the Mount of Olives shall be split in two, from east to west, making a very large valley.... Thus the LORD my God will come, and all the saints with You. Acts 1:9-11 - Now when He had spoken these things, while they watched, He was taken up, and a cloud received Him out of their sight. And while they looked steadfastly toward heaven, as He went up behold, two men stood by them in white apparel, who also said, "Men of Galilee, why do you stand gazing up into heaven? This same Jesus, who was taken up from you into heaven, will so come in like manner as you saw Him go into heaven." Matthew 24:30 - Then the sign of the Son of Man will appear in heaven, and then all the tribes of the earth will mourn, and they will see the Son of Man coming on the clouds of heaven with power and great glory. Mark 13:26 - Then they will see the Son of Man coming in the clouds with great power and glory. Psalm 18:7-14 - Then the earth shook and trembled; the foundations of the hills also quaked and were shaken, because He was angry. Smoke went up from His nostrils, and devouring fire from His mouth; coals were kindled by it. He bowed the heavens also, and came down with darkness under His feet. And He rode upon a cherub, and flew; He flew upon the wings of the wind. He made darkness His secret place; His canopy around Him was dark waters and thick clouds of the skies. From the brightness before Him, His thick clouds passed with hailstones and coals of fire. The LORD thundered from heaven, and the Most High uttered His voice, hailstones and coals of fire. He sent out His arrows and scattered the foe, lightnings in abundance, and He vanquished them. Psalm 97:1-6 - The LORD reigns; let the earth rejoice; let the multitude of isles be glad! Clouds and darkness surround Him; righteousness and justice are the foundation of His throne. A fire goes before Him, and burns up His enemies round about. His lightnings light the world; the earth sees and trembles. The mountains melt like wax at the presence of the LORD, at the presence of the Lord of the whole earth. The heavens declare His righteousness, and all the peoples see His glory. In short, the clouds Christ is coming with are the heavenly hosts, but He will also probably come in a literal cloud when He returns to Earth in judgment, as described in the Psalms above. Revelation 1:7 - ...and every eye will see Him, even they who pierced Him. If that is the case, in order for everyone in the world to see Him coming, Jesus and the heavenly armies will likely make a grand procession around the earth as He returns. Matthew 26:63-64 - But Jesus kept silent. And the high priest answered and said to Him, "I put You under oath by the living God: Tell us if You are the Christ, the Son of God!" Jesus said to him, "It is as you said. Nevertheless, I say to you, hereafter you will see the Son of Man sitting at the right hand of the Power, and coming on the clouds of heaven." John 19:32-37 - Then the soldiers came and broke the legs of the first and of the other who was crucified with Him. But when they came to Jesus and saw that He was already dead, they did not break His legs. But one of the soldiers pierced His side with a spear, and immediately blood and water came out. And he who has seen has testified, and his testimony is true; and he knows that he is telling the truth, so that you may believe. For these things were done that the Scripture should be fulfilled, "Not one of His bones shall be broken." And again another Scripture says, "They shall look on Him whom they pierced." While there might be a non-physical view of the return of Jesus in the spiritual realm, in taking the literal rendering of the text, there is no doubt that Jesus will return in a physical body to Earth, where physical eyes will witness the event. As a side note, it is incredible that centuries before the crucifixion, David prophesied that Jesus would be rejected by His own people and be pierced in His hands and feet, long before this type of execution was ever implemented. Psalm 22:16 - For dogs have surrounded Me; the congregation of the wicked has enclosed Me. They pierced My hands and My feet. Psalm 34:20 - He guards all his bones; Not one of them is broken. John 19:31-37 - Therefore, because it was the Preparation Day, that the bodies should not remain on the cross on the Sabbath (for that Sabbath was a high day), the Jews asked Pilate that their legs might be broken, and that they might be taken away. Then the soldiers came and broke the legs of the first and of the other who was crucified with Him. But when they came to Jesus and saw that He was already dead, they did not break His legs. But one of the soldiers pierced His side with a spear, and immediately blood and water came out. And he who has seen has testified, and his testimony is true; and he knows that he is telling the truth, so that you may believe. For these things were done that the Scripture should be fulfilled, "Not one of His bones shall be broken." And again another Scripture says, "They shall look on Him whom they pierced." Exodus 12:43-47 - And the LORD said to Moses and Aaron, "This is the ordinance of the Passover: No foreigner shall eat it. But every man's servant who is bought for money, when you have circumcised him, then he may eat it. A sojourner and a hired servant shall not eat it. In one house it shall be eaten; you shall not carry any of the flesh outside the house, nor shall you break one of its bones. All the congregation of Israel shall keep it. Revelation 1:7 - And all the tribes of the earth will mourn because of Him. Zechariah 12:10 - "And I will pour on the house of David and on the inhabitants of Jerusalem the Spirit of grace and supplication; then they will look on Me whom they pierced. Yes, they will mourn for Him as one mourns for his only son, and grieve for Him as one grieves for a firstborn. In that day there shall be a great mourning in Jerusalem, like the mourning at Hadad Rimmon in the plain of Megiddo. And the land shall mourn, every family by itself: the family of the house of David by itself, and their wives by themselves; the family of the house of Nathan by itself, and their wives by themselves; the family of the house of Levi by itself, and their wives by themselves; the family of Shimei by itself, and their wives by themselves; all the families that remain, every family by itself, and their wives by themselves." James 4:8-10 - Draw near to God and He will draw near to you. Cleanse your hands, you sinners; and purify your hearts, you double-minded. Lament and mourn and weep! Let your laughter be turned to mourning and your joy to gloom. Humble yourselves in the sight of the Lord, and He will lift you up. Isaiah 61:1-4 - "...He has sent Me to heal the brokenhearted.... To comfort all who mourn, to console those who mourn in Zion, to give them beauty for ashes, the oil of joy for mourning, the garment of praise for the spirit of heaviness; that they may be called trees of righteousness, the planting of the LORD, that He may be glorified." And they shall rebuild the old ruins, they shall raise up the former desolations, and they shall repair the ruined cities, the desolations of many generations. Luke 6:25 - ...Woe to you who laugh now, for you shall mourn and weep. Revelation 1:7 - Even so, Amen. Numbers 5:22 - ...Then the woman shall say, "Amen, so be it." The first and last letters of the Greek alphabet are "alpha" and "omega." 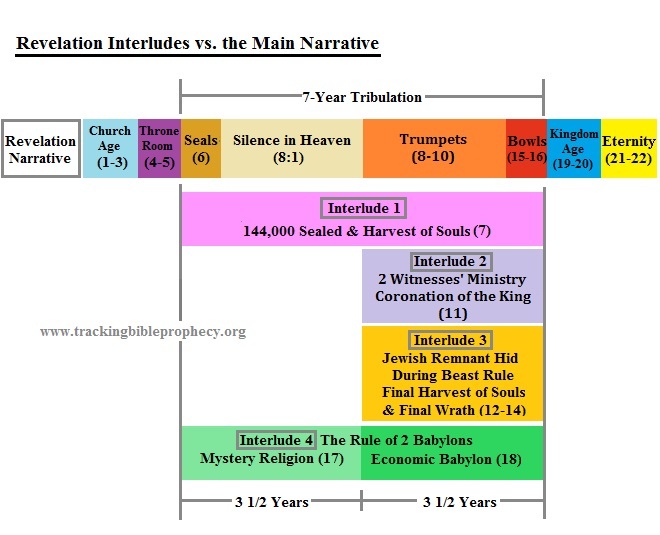 This is another way of saying "the beginning and the end," or the "first and the last" (Revelation 1:11). In Jewish tradition, "the alpha and omega" was a common expression used to depict the entirety of something. Isaiah 43:10-13 - "...Before Me there was no God formed, nor shall there be after Me. I, even I, am the LORD, and besides Me there is no savior. I have declared and saved, I have proclaimed, and there was no foreign god among you; therefore you are My witnesses," Says the LORD, "that I am God. Indeed before the day was, I am He; and there is no one who can deliver out of My hand; I work, and who will reverse it?" Revelation 1:8 - "...the Almighty." Genesis 17:1-2 - When Abram was ninety-nine years old, the LORD appeared to Abram and said to him, "I am Almighty God; walk before Me and be blameless. And I will make My covenant between Me and you, and will multiply you exceedingly." 1 Peter 5:1 - The elders who are among you I exhort, I who am a fellow elder and a witness of the sufferings of Christ, and also a partaker of the glory that will be revealed. James 1:2-4 - My brethren, count it all joy when you fall into various trials, knowing that the testing of your faith produces patience. But let patience have its perfect work, that you may be perfect and complete, lacking nothing. If any of you lacks wisdom, let him ask of God, who gives to all liberally and without reproach, and it will be given to him. The "manifest evidence of the righteous judgment of God" shows the Lord's direction in each believer's life and evidence to the world that they are a true Christian. "Righteous judgment" comes by trial or tribulation, which builds character, or chastening, which corrects sin. Consequently, God will not judge or condemn a believer with the world (1 Corinthians 11:31-32). In other words, while salvation is all about grace (Ephesians 2:8), and you can do nothing by yourself to "be counted worthy of the kingdom of God" (2 Thessalonians 1:5), God gives evidence to the world that you belong to His Kingdom when you acquire patience through tribulations, which helps build character and cultivate proper Christian conduct. Revelation 1:9 - [I John...] was on the island that is called Patmos for the word of God and for the testimony of Jesus Christ. 2 Timothy 1:8-12 - Therefore do not be ashamed of the testimony of our Lord, nor of me His prisoner, but share with me in the sufferings for the gospel according to the power of God, who has saved us and called us with a holy calling, not according to our works, but according to His own purpose and grace which was given to us in Christ Jesus before time began, but has now been revealed by the appearing of our Savior Jesus Christ, who has abolished death and brought life and immortality to light through the gospel, to which I was appointed a preacher, an apostle, and a teacher of the Gentiles. For this reason I also suffer these things; nevertheless I am not ashamed, for I know whom I have believed and am persuaded that He is able to keep what I have committed to Him until that Day. John 5:33-39 - You have sent to John, and he has borne witness to the truth. Yet I do not receive testimony from man, but I say these things that you may be saved. He was the burning and shining lamp, and you were willing for a time to rejoice in his light. But I have a greater witness than John's; for the works which the Father has given Me to finish - the very works that I do - bear witness of Me, that the Father has sent Me. And the Father Himself, who sent Me, has testified of Me. You have neither heard His voice at any time, nor seen His form. But you do not have His word abiding in you, because whom He sent, Him you do not believe. You search the Scriptures, for in them you think you have eternal life; and these are they which testify of Me. Ezekiel 37:1-2 - The hand of the LORD came upon me and brought me out in the Spirit of the LORD, and set me down in the midst of the valley; and it was full of bones. Then He caused me to pass by them all around, and behold, there were very many in the open valley; and indeed they were very dry. There are at least three schools of thought about the "Lord's Day." Isaiah 58:13 - "If you turn away your foot from the Sabbath, from doing your pleasure on My holy day, and call the Sabbath a delight, the holy day of the LORD honorable, and shall honor Him, not doing your own ways, nor finding your own pleasure, nor speaking your own words." Mark 16:9 - Now when He rose early on the first day of the week, He appeared first to Mary Magdalene, out of whom He had cast seven demons. Acts 20:7 - Now on the first day of the week, when the disciples came together to break bread, Paul, ready to depart the next day, spoke to them and continued his message until midnight. 1 Corinthians 16:2 - On the first day of the week let each one of you lay something aside, storing up as he may prosper, that there be no collections when I come. Obadiah 1:15 - "For the day of the LORD upon all the nations is near; as you have done, it shall be done to you; your reprisal shall return upon your own head. The "Day of the Lord" is also used in Scripture to describe historical periods, where the Lord poured out His Wrath. In other words, it is not used exclusively as a term for the future Tribulation. Since the first day of the week was never called the "Lord's day" in Scripture, while the Sabbath was, I believe it is possible that John was given the Revelation on the Sabbath day, but it is also possible that he was spiritually transported in time by the Holy Spirit to the eschatological "Day of the Lord." Job 39:25 - At the blast of the trumpet he says, 'Aha!' He smells the battle from afar, the thunder of captains and shouting. Leviticus 25:9 - Then you shall cause the trumpet of the Jubilee to sound on the tenth day of the seventh month; on the Day of Atonement you shall make the trumpet to sound throughout all your land. 2 Samuel 2:28 - So Joab blew a trumpet; and all the people stood still and did not pursue Israel anymore, nor did they fight anymore. Psalm 47:2-5 - For the LORD Most High is awesome; He is a great King over all the earth. He will subdue the peoples under us, and the nations under our feet. He will choose our inheritance for us, the excellence of Jacob whom He loves. Selah God has gone up with a shout, the LORD with the sound of a trumpet. 1 Thessalonians 4:16 - For the Lord Himself will descend from heaven with a shout, with the voice of an archangel, and with the trumpet of God. And the dead in Christ will rise first. 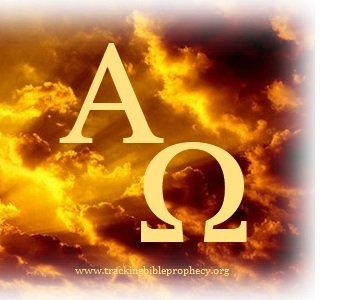 Revelation 1:11 - ...saying, "I am the Alpha and the Omega, the First and the Last..."
See Revelation 1:8 for commentary about "the Alpha and Omega." Romans 8:29 - For whom He foreknew, He also predestined to be conformed to the image of His Son, that He might be the firstborn among many brethren. Isaiah 41:4 - "Who has performed and done it, calling the generations from the beginning? 'I, the LORD, am the first; and with the last I am He.'" Isaiah 48:3, 5, 12-13 - I have declared the former things from the beginning; they went forth from My mouth, and I caused them to hear it. Suddenly I did them, and they came to pass.... Even from the beginning I have declared it to you; before it came to pass I proclaimed it to you.... "Listen to Me, O Jacob, and Israel, My called: I am He, I am the First, I am also the Last. Indeed My hand has laid the foundation of the earth, and My right hand has stretched out the heavens; when I call to them, they stand up together." Revelation 1:11 - ...and, "What you see, write in a book..."
Habakkuk 2:2-3 - Then the LORD answered me and said: "Write the vision and make it plain on tablets, that he may run who reads it. For the vision is yet for an appointed time; but at the end it will speak, and it will not lie. Though it tarries, wait for it; because it will surely come, it will not tarry." 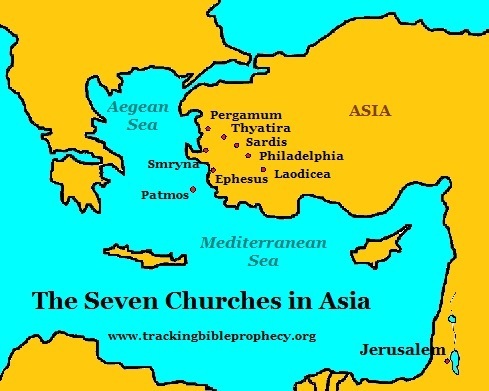 Revelation 1:11 - "...and send it to the seven churches which are in Asia: to Ephesus, to Smyrna, to Pergamos, to Thyatira, to Sardis, to Philadelphia, and to Laodicea." When John finished recording the events revealed to him, he was to send his account to seven specific churches in Asia, or current day Turkey. Note on the map below, the churches are given in clockwise in order. Some speculate that one of the reasons the Lord listed these church in this order, is because it would have been the most efficient route for someone to hand deliver the message.